In spite of a large, vibrant and outspoken civil society, the Egyptian state’s respect for human rights and civic freedoms remains at an acute crisis point. On 28th September 2018, several UN experts including released a statement referring to the deteriorating space for civil society space in Egypt. The statement refers to the cases of several HRDs including Ms. Amal Fathy, Mr. Shadi al-Ghazali Harb, Mr. Mohamed Ibrahim Radwan (also known as “Mohamed Oxygen”), Mr. Wael Abbas, and Mr. Haytham Mohamadein. 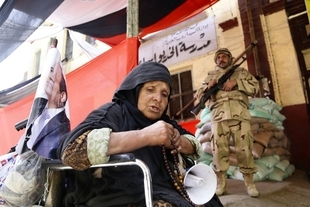 UN #HumanRights experts condemn “systematic targeting” of human rights defenders in #Egypt. The statement refers to the cases of several HRDs including Amal Fathy, Shadi al-Ghazali Harb, Mohamed Ibrahim Radwan (also known as “Mohamed Oxygen”), Wael Abbas, and Haytham Mohamadein. Many of these cases were previously covered on the CIVICUS Monitor. All of these human rights defenders have been held in detention for the past five months and face lengthy jail terms if convicted. Amal Fathy, was recently sentenced to two years in jail after posting a video on social media detailing her experiences of sexual harassment and criticising the government's lack of action to protect women. Despite the disproportionate sentence, Fathy still faces further charges. Many civil society groups suspect these activists have been targeted for their work on corruption, torture, extra-judicial killings, and women’s rights. The UN experts called on the Egyptian authorities to ensure a fair, impartial and public trial in accordance with Egypt’s obligations under international human rights law. Another wave of arrests in early November 2018 triggered further alarm. On 1st November 2018, eighteen people were arrested in a series of raids across Egypt. Those arrested include a number of human rights lawyers and activists. They include: Hoda Abdelmoniem, Mohamed Abu Horira, Aisha Al-Shater, Samia Nassif, Sahar Hathut, Riwaya Al-Shafai, Alia Ismail, Iman Al-Qadi, Marwa Ahmad Madbouli, Baha Oda, Shadi Abu Al-Nagha, Tareq Al-Salkawy, Ahmed Al-Hadhbi, Mohamed Al-Ahadhbi, Ismail Shahat, Salwy Abdel Karim, Osama Ibrahim and Ibrahim Ata. While the reason for their detention remains unclear, a number of the arrested are affiliated with the Egyptian Coordination for Rights and Freedoms (ECRF), a group known for its work documenting enforced disappearances and the use of the death penalty. The group is well-known for sharing information with international CSOs, such as Human Rights Watch. In addition, the ECRF's executive director, Ezzat Ghoneim and Azouz Mahgoub have been have been missing since mid-September 2018. Latest reports from the ground note that the number of arrested has increased. At the time of writing no further information was available on where the activists are being held or their health. #UPDATE on #Egypt mass arrest last Thursday. At least 31 people arrested, among them a former member of @nchregypt and #ECRF activists. @ecrfeg executive director #EzzatGhoneim has been missing since September. Egyptian civil society is under attack. In response, Human Rights Watch released a statement calling for the activists' release. According to the Egyptian “Stop Enforced Disappearance” independent campaign, authorities have forcibly disappeared at least 230 people between August 2017 and August 2018. The latest wave of disappearances increasingly targeting journalists and rights activists. The situation is made worse by Egypt's systemic use of torture against detainees. In light of this, there are growing concerns over the welfare of the disappeared. "One year after raising the rainbow flag incident at Mashrou’ Leila concert and the subsequent security campaign, and five years after the increasing systematic targeting of gay men and transgender women or those suspected to be so, that this approach in dealing with consensual relationships between adults is an explicit violation of a number of fundamental rights enshrined in the constitution and in the international human rights instruments ratified by successive Egyptian governments, primarily the right to non-discrimination, the right to privacy, the right to a fair trial and the freedom from torture and inhuman or degrading treatment." Of late, Egyptian authorities have become particularly sensitive to criticism. On 14th October 2018, Egyptian authorities arrested Abdel Khaleq Farouk and Ibrahim al-Khateeb. Abdel Khaleq Farouk, a economic researcher had recently published a book which was critical of Egypt's economic policy. Ibrahim al-Khateeb owns the press which was printing the title. Farouk's analysis criticised the government's management of human resources and management of government agencies. During their arrest, Egyptian authorities also seized 200 copies of the book to prevents its release. Both individuals were interrogated at Shorouk Police Station and were charged with "spreading false information". Despite this, both Abdel Khalek Farouk and Ibrahim al-Khateeb were released on 29th October 2018, after appealing their 15-day detention order. The court ordered their release on the condition they provide their address. Their arrest epitomises the Egyptian authorities zero-tolerance policy to dissent throughout 2018. "This law is tantamount to extortion because journalists now have to pay if they want to work. The implementation of this very coercive media law has a clear political objective – to silence the last independent voices. We are facing the probable extinction or exile of Egypt’s last independent media. As previously covered on the CIVICUS Monitor, Egyptian authorities have already blocked at least 500 websites this year. Those outlets who have already been banned stand little chance of gaining a license. Similarly, the chilling effect of the law is already evident. One website, launched by the Arabic Network for Human Rights Information (ANHRI) to document human rights violations in Egypt has already stopped operating. Meanwhile, the website Katib announced it would not apply for a licence as it had already been banned by Egyptian authorities. ANHRI stated it could not afford to apply for a licence as there were no guarantees it would be successful. Civil society in Egypt is currently regulated and governed by the provisions of the Law on Associations and Community Foundations of 2002. Civil society in Egypt is currently regulated and governed by the provisions of the Law on Associations and Community Foundations of 2002. This legal framework has granted significant discretionary power to the state to disrupt or otherwise target civil society groups perceived as being aligned to the political opposition. In September 2016, Egypt’s Cabinet approved a new draft law to govern civil society organisations. If enacted, the draft law would grant the Egyptian state sweeping powers to deny organisations’ registration, constrain their operational activities, and regulate and restrict access to foreign funding sources. In practice, human rights associations are extremely vulnerable to state harassment, and even forced closure. Throughout 2015, the government reportedly closed more than 480 NGOs because of their alleged links to the Muslim Brotherhood group. On September 17th 2016, a criminal court issued an order to freeze the personal assets of five prominent civil society leaders, and ordered the freezing of assets held by three civil society groups. Egyptian authorities continue to arbitrarily restrict the right to freedom of peaceful assembly under the 2013 Protest Law. Egyptian authorities continue to arbitrarily restrict the right to freedom of peaceful assembly under the 2013 Protest Law. State security forces have used excessive, unnecessary and at times lethal force to disperse “unauthorised” demonstrations and other public gatherings, resulting in deaths and serious injuries.There has been no credible investigation or criminal accountability for the killing of at least 817 protesters in Cairo’s Rab’a al-Adawiya Square on August 14, 2013. Security forces shot and killed protester Shaimaa Al-Sabbagh on 24th January 2015 during a demonstration in central Cairo. At least 27 people died in protest-related violence between 23rd and 26th January 2015. In April 2016, security forces used tear gas to shut down small protests against President Sisi. Journalists reporting on sensitive political topics, or working for outlets critical of state authorities are routinely prosecuted on politically motivated charges. Journalists reporting on sensitive political topics, or working for outlets critical of state authorities are routinely prosecuted on politically motivated charges. At the end of 2015, 23 journalists remained imprisoned in Egypt, according to the Committee to Protect Journalists. Throughout 2016, many journalists have been arrested, prosecuted, or jailed, including human rights defender and press freedom advocate Gamal Eid, chair of the Journalists Syndicate Yehia Qallash, and photographer Ali Abdeen.